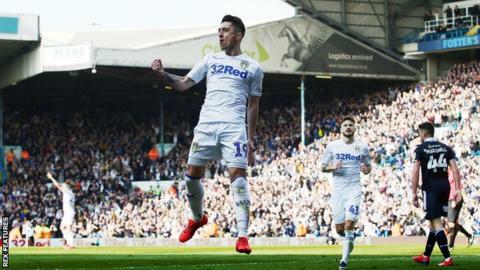 Pablo Hernandez's double moved Leeds back into the Championship's automatic promotion spots as they twice came from behind to beat struggling Millwall. The Spaniard's late winner took his season's tally to 12 goals as the Whites leapfrogged Sheffield United to go second, two points clear of their Yorkshire rivals. A Ben Thompson strike and a Ben Marshall penalty twice put Millwall ahead but they were pegged back by Hernandez's first and a Luke Ayling header. That meant Patrick Bamford's first-half penalty miss did not prove costly, while defeat dropped Millwall two places to 21st and they stay just a point above the bottom three. On an afternoon that could foreshadow the twists and turns still to come in the promotion race, Leeds looked set to lose ground on their rivals for much of the day, only to end up back in the top two due to the Blades twice surrendering a lead to lose to Bristol City. That they did so was down chiefly to Hernandez, who again stepped up for a Leeds side still missing injured top scorer Kemar Roofe. He inspired Leeds' fightback after they fell behind early on, Thompson heading home Mahlon Romeo's cross for the Millwall midfielder's third goal in two games. Lions keeper David Martin thwarted Leeds' initial retorts, saving Bamford's penalty with his legs after Jed Wallace brought down Ezgjan Alioski and denying Jack Harrison from Hernandez's through ball. But he was left helpless when Hernandez clinically steered Ayling's pull-back into the bottom corner to bring Leeds level. Marshall put Millwall back ahead from the spot after being fouled by Liam Cooper, and when Martin twice foiled Hernandez it seemed the keeper would redeem his recent FA Cup howler against Brighton. However, Ayling headed home Barry Douglas' cross to bring Leeds level for a second time before Hernandez slid home Tyler Roberts' cut-back to win it. "Some days we have to spend more time than we usually would need to spend to get what we deserve. "We never feel we are going to lose. We insist on trying to change the result by keeping our style. When a team has the skill to overcome so much adversity, they deserve admiration." On Sheffield United's defeat by Bristol City: "Every game we play we can't be thinking about the result of any other team." "It was probably a fair result on possession and chances created. "We were leading twice in the game and for us to come to Elland Road, it was a good performance in so many ways. "We can talk about how good we were on the counter-attack, with the ball, how well we defended at times and stood strong at a sold-out Elland Road, but ultimately we got nothing from the game. "Leeds are a top side and we ran them very close today." Match ends, Leeds United 3, Millwall 2. Second Half ends, Leeds United 3, Millwall 2. Jack Clarke (Leeds United) is shown the yellow card for a bad foul. Attempt missed. Tyler Roberts (Leeds United) right footed shot from the left side of the box is too high. Assisted by Patrick Bamford. Substitution, Millwall. Tom Elliott replaces Ben Thompson. Substitution, Millwall. Steve Morison replaces Ryan Tunnicliffe. Goal! Leeds United 3, Millwall 2. Pablo Hernández (Leeds United) right footed shot from very close range to the centre of the goal. Assisted by Tyler Roberts. David Martin (Millwall) is shown the yellow card. Attempt missed. Patrick Bamford (Leeds United) left footed shot from outside the box is too high from a direct free kick. Attempt missed. Kalvin Phillips (Leeds United) header from the left side of the six yard box is too high. Assisted by Pablo Hernández with a cross following a corner. Corner, Leeds United. Conceded by David Martin. Attempt saved. Adam Forshaw (Leeds United) right footed shot from outside the box is saved in the bottom left corner. Attempt blocked. Pablo Hernández (Leeds United) right footed shot from a difficult angle on the left is blocked. Assisted by Jack Harrison. Corner, Leeds United. Conceded by Jed Wallace. Goal! Leeds United 2, Millwall 2. Luke Ayling (Leeds United) header from the centre of the box to the high centre of the goal. Assisted by Barry Douglas with a cross. Substitution, Leeds United. Jack Clarke replaces Pontus Jansson. Attempt saved. Pablo Hernández (Leeds United) left footed shot from outside the box is saved in the bottom right corner. Assisted by Patrick Bamford.